Spirally wound coils around a helix to form a spring. Coiled compression springs will have pitch in between each coil while coiled extension and torsion springs’ coils will be helically wound one on top of the other. Coiled compression springs are the most common type of spring in the industry. You will find them in pens, medical devices, buttons, pogo sticks etc. The rate of force these exert is due to the coiled spring’s physical dimensions like its number of coils, active or inactive. But, what is the difference of active and inactive coils? Coiled compression springs have different end types: closed, closed and ground, double closed, or open ends. Active coils are the ones that have pitch in between since the distance in between the coils is one of the factors that give this spring its strength. Inactive coils have no pitch in between therefore not exerting any force from the coiled spring. When a coil spring has open ends, all coils are active due to the pitch in between ALL of the coils. 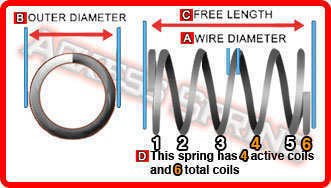 This means that if your coiled spring has a total of 10 coils, it'll also have 10 active coils and all these coils will help your spring exert its force. Closed and squared ends have no pitch. For this reason, the first and last coils (the ends) of your coiled spring are inactive. If you have a coiled spring with 10 total coils, you will subtract these two inactive coils from the total to calculate the amount of active coils of your coiled compression spring. Coiled springs with closed and ground ends are almost the same as coiled springs with closed and square ends. The only difference between these two is that 1/2 of the wire diameter of the first and last coil is ground off in order to provide vertical stability. Other than this, this spring’s coils will have the same amount of active and inactive coils as a spring with closed and square ends as well as the same amount of pitch. Double closed ends, like closed and ground ends, are also used to provide stability. In this case the closed coils on the ends are two. This means that you now have four inactive coils so if you have the same spring with 10 coils, you will have 6 active coils. Note: Changing the type of ends on your coiled compression spring can affect your spring’s force due to the fact that the number of active coils changes.